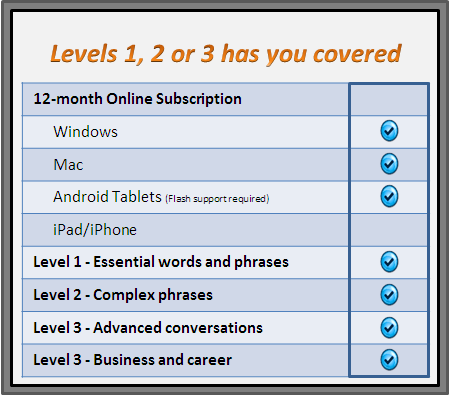 Level 1: Learn the essential words and phrases you will need in order to get around with ease. Learn basic vocabulary and everyday phrases in no time! Topics include first words, food, colors, phrases, body parts, numbers, time, shopping, countries and more. Level 2: Learn more complex phrases, correct pronunciation and how to converse in your new language. Talk about sports and hobbies, family, friends and work situations! Other topics include the alphabet, greetings, restaurant, hotel, business, technology, computers, emergencies and travel. Level 3: Reach your language-learning goals by immersing yourself in advanced conversations that will refine your language skills and help you retain what you learned. Topics include people, food, animals, numbers, seasons, working and more. Level 3 Business: We help doing business with someone who doesn’t speak your native language. 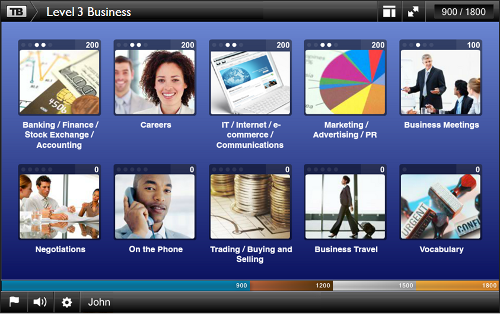 This module helps you learn basic business vocabulary in banking, marketing, negotiations, travel and more. How does Instant Immersion™ work? The Instant Immersion courses are designed to get novices familiar with the basics of a new language. But Instant Immersion won’t bog you down with the rigid structure of learning the A-E-I-O-U’s, conjugations and other stuff you hated learning while sitting in a high school class. Instant Immersion does focus on getting you familiar with a new language so you can use it on vacation, in business or as an extra learning-tool for school. Instant Immersion does not focus on grammar and syntax lessons teaching useless sentences, such as, "My bike is not red." What does this mean? It means Instant Immersion was not designed to be the same type of course taken in school. Instant Immersion was, however, designed to get you speaking essentials of the language in common situations right away. Instant Immersion is not a curriculum-based learning software product, but a product that fits the needs of those who may be supplementing a rigid course structure offered elsewhere or for the casual learner who has specific needs, such as communicating at work and on business, or while traveling on vacation. There are many ways to learn a new subject. Instant Immersion uses the methods that have been proven and taught in all levels of education: sound, graphics, video, text and interaction. In some modules in this program, you will see a picture for a word or phrase and the spelling of the words, and you will also hear the voice of a native speaker saying the word or phrase. Other modules will show videos of real-life situations that combine native speakers and the text of their conversation(s). Instant Immersion uses the proven method of repetition to help reinforce the subject matter. A flashcard approach allows you to see the word or phrase and match it with the translation. When you learned your native language, you took many years to learn the rules of syntax, conjugation, sentence structure and grammar. When using Instant Immersion to quickly learn a new language, we teach you words and phrases to help you converse comfortably with others. We do not bog you down in all the semantics that can take you years to learn. The goal is to be conversant in the new language, not to become a native speaker or a grammar school teacher. Learning a new language really requires you to practice with the program and with others. If you are going on a vacation, share your goals with others and practice with them. Gift them the same software so you can learn and practice together. You can also look at YouTube clips related to your learning goals. For example, if you want to practice identifying food on a menu, search “ordering food in Mexico” or “food in Spanish.” You could also look for foreign language webcasts online using a website such as www.ustream.tv to see how much of the conversation you are able to understand. We do not expect Instant Immersion software to be the only learning tool you use to meet your goals. Even if you have a simple goal of ordering from a menu, you should at least try it out at a local restaurant that serves food from the country of the language you are trying to learn. It’s always a good idea to get others involved in your learning journey. The best way to succeed is to have a goal. Without setting a goal, you will not feel like you have achieved anything for the time invested in using the software. You can set a large goal, such as being able to communicate the basics when on a vacation in France. But then break it into smaller goals. A small goal could be simply identifying the major food ingredients on a menu (beef, chicken, cheese, pasta). This small goal could easily be achieved by going into the Food section of the program and skipping words that do not meet your goal (like fork and knife). You would use the Word Practice section to learn the relevant words. Then record yourself to test your pronunciation. You can then move to the Easy and Hard games to see if you are retaining the vocabulary by matching pictures, text and sounds. You can print the picture dictionary flashcards to use for offline learning with a friend. We really want you to succeed in your learning goals. Sure Instant Immersion’s program could show lists of words and pictures over and over again, but you would quickly lose interest in learning a new language. Instant Immersion embeds games in the product to make learning fun and to break up the exercises into smaller chunks. When you interact with the games, you are actively participating in the learning process instead of sitting back and just watching a video. The games are targeted to learning objectives in each module. If you have issues with a particular section, you can easily go back into any other section in the module and redo the learning experience. Then you can then go into the same game and see if you can improve your score. Instant Immersion does not use speech recognition. Although technology continues to improve, it cannot surpass the human ear connected to your brain. That’s why Instant Immersion uses a simple and effective method to help evaluate your performance—record and playback. You will see the phrase displayed on the screen, hear a native speaker pronounce the phrase and then Instant Immersion records you saying the phrase. After your recording is done, you will hear the native speaker again followed by your recording. You and your ears are the best judge for how well it matches. Repeat the process until you are happy with the results. 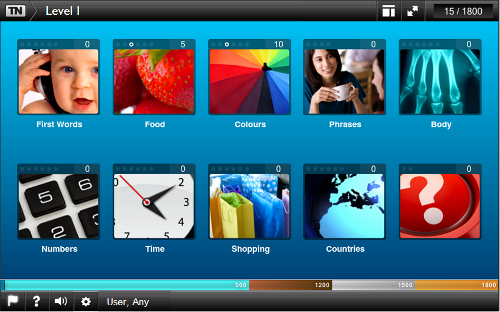 Fancy technology gives you the impression that the program is controlling and commenting on your voice. Sometimes learners mistakenly place full trust in a technology. We believe you will be more attentive and aware when you hear yourself played back. Instant Immersion’s approach is to use a free-form method of navigating the course structure. There is no requirement to complete section A before moving to section B. This is done to prevent you from giving up when you encounter a section or topic that is not relevant to your goals. You can simply skip a section and move to one that matches your interests. Instant Immersion’s user interface has visual indicators of the status of each section—what’s in progress, what has not been started and what has been completed. Instant Immersion also tracks your score for each exercise and displays printable certificates of achievement.